myelpedison services now go mobile: ELPEDISON is the 1st Electricity Supplier in the Greek energy market to offer a dedicated mobile application to its consumers with that many services options. ELPEDISON, the reliable and friendly electricity Supplier announces the launch of myelpedison service portfolio on mobile. A dedicated application called “myelpedison” is now available on Google Play and Apple Store. Therefore, any ELPEDISON customer holding an android or ios device can now easily download the application and enjoy a wide portfolio of energy related services that can facilitate his everyday life. Precisely, myelpedison on mobile includes the very new service count-on-your-own, which gives the possibility to ELPEDISON customers to directly register their meter reading through their mobile, so that their “on account” electricity bills are issued based on their actual consumption till the clearance bill each time, which is issued based on the Network’s Operator certified data. 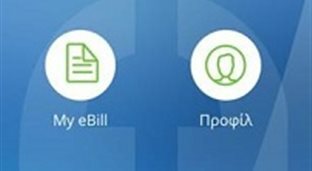 Furthermore, myelpedison on mobile provides the e-bill service, which enables customers to consult their current bill as soon as it is issued, as well as to get access to their past electricity bills, up to 3 years behind. Also, ELPEDISON customers can follow an interactive guide which assists them to better understand their bill and its different fields. Additionally, they can see the evolution of their consumption through dedicated graphs, depicted whether in euros or kWh. It is also worth mentioning that ELPEDISON customers, by using myelpedison on mobile, can on top save considerable time since they can pay their bill on the spot, via e-bill’s dedicated pay-on-line service, in a secure payment environment. What’s more, ELPEDISON customers can change their profile details and update their contact data, through change my profile and my contact data services, respectively. The downloading of the application is straight forward and it is done as with any other application of Google Play and Apple Store. By the same token, the customer’s registration to myelpedison on mobile is fast and easy, since it only requires some primary data by the side of the customer. ELPEDISON has made the difference in the Greek energy market, with a wide service offering at the hand of the consumer. Having started with the on-line myelpedison services through its web-site, now it also offers all such services along with new ones, through a mobile device. ELPEDISON will continue leveraging on the latest technology, providing advanced and friendly services to its customers on top of its highly competitive energy products and up-scale customer support.